Since the beginning of autumn, many newly married people will be preparing to organize an autumn wedding after the beginning of autumn. In autumn, Dangui fragrance, these idioms are to describe the good atmosphere of autumn. When autumn comes, if you love is ripe, do you want to hold a fall wedding? Married in the autumn, whether it is to hold an indoor wedding, or autumn outdoor wedding, are inseparable from the wedding decorations. If you want to achieve a more nuanced effect, you must first prepare some wedding decorations that are simple and romantic. Personalized fashion garlands, romantic and warm door hangings, cute and funny new portraits, Yiwu small commodity market ultra-rich wedding supplies, there is always one for you, and add a bright spot for your wedding. â€œIâ€™m getting married soon. My husband and I went to Yiwu market today and specially bought some beautiful little things to decorate the new house. This Korean version of the door is hanging, and my husband and I are very eager to buy home hanging on the wall and hanging. On the ceiling, it must be very romantic and festive.â€ Ms. Chen and her fiancÃ© plan to hold a wedding in the second half of the year to form their own home. This does not, taking advantage of the gap between the two couples on holiday, they hurriedly come to Yiwu market to purchase. â€œThe things to get prepared for marriage are not only beautiful and meaningful, but also practical. 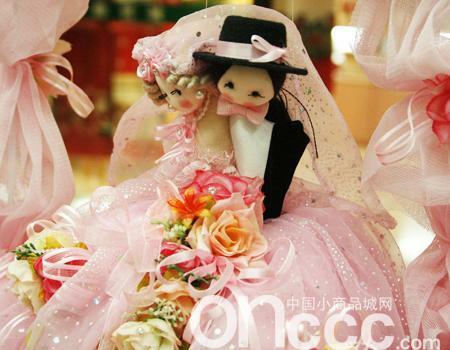 This Korean wedding doll with rhinestones hangs on the door, and the dolls are very beautiful. The pink lace, beaded and ribbons decorate the garlands together. The boss said This door is a symbol of sweet love and happy life, the price is affordable, embellishment of new homes at home, will certainly envy my group of unmarried ** sisters!" According to the store's Fan Xueqing's wife, this kind of new people's decoration with a strong romantic atmosphere is deeply loved by new people. â€œNow young people love to watch Korean dramas and Taiwanâ€™s youth idol dramas. Many playtime wedding scenes, new rooms, couple rooms, or even the little girlâ€™s room, love to use these pink hanging ornaments to dress up the room. It can be said that in the past two years, influenced by television dramas, Chinese young people dressed up in their own houses and loved this Korean style and Taiwanese style." The proprietress told reporters that such double-hanging Korean wedding doll ornaments Very particular about the use of materials, no matter how discerning guests can stand the test. The perfect combination of lace, silk flowers, rhinestones, and cloth dolls allows new people to feel a different wedding mood. Wreaths and dolls are two-in-one designs. The dolls can be individually removed as furnishings and placed on a nightstand or on a computer desk. The garland pendants that are removed can also be used alone as door hangers. Some of the sashes with bottom panels can also be decorated with small accessories to make them really worth the money!